The west coast of Ireland from Galway Bay down to Dingle Bay. Scale: 1 : 200,640. One and two-minute gridlines. Larger scale plans of Fenit Island, Foynes island, Limerick, Kilrush, Kilronan (Aran Islands), Galway bay, Galway Harbour, Cashla, Dingle harbour, River Shannon. 2015 edition - Fully updated throughout. 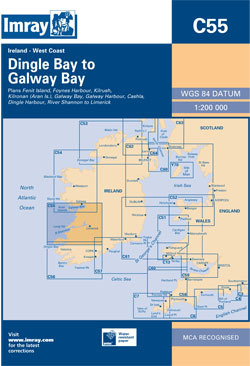 On this 2015 edition revised depths are shown throughout, in particular at Cashla Bay, Galway Bay, Kilronan, around Fenit Island and at Dingle Bay. Completed harbour developments at Kilronan are also shown.